June might not be the best month to head to Alaska for a Denali Day Tour, but the weather is so unpredictable that other months might not be better. 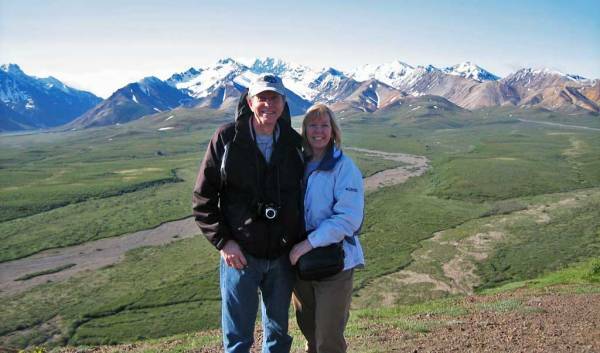 We arrived for our Denali Day Tour on a flight in to Anchorage. 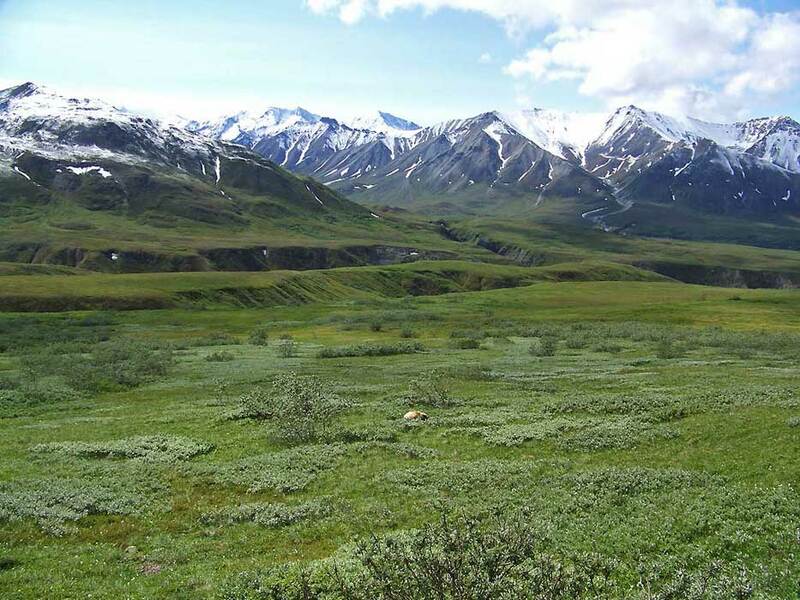 Anchorage is a typical city, but it’s tucked between glaciated peaks, flat forested areas and Cook Inlet. A rental car was a much cheaper and more convenient than taking the Alaska Railway or joining a cruise land tour. The drive to Denali Village was not that exciting in the overcast weather. Just north of Anchorage, some of the peaks are spectacular and reminded me of the Canadian Rockies. Once you’ve cleared the Cook Inlet though, you move away from the mountain chains. 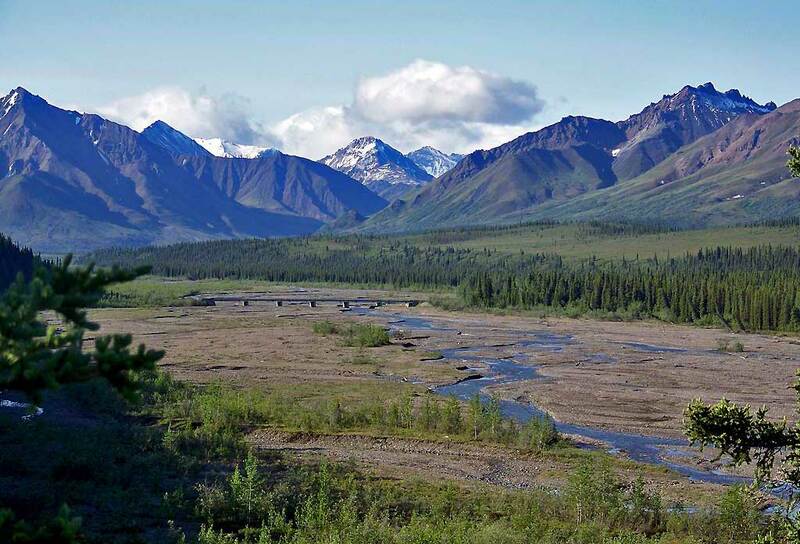 After Wasilla it’s remote, flat and forested with short growth pine and some substantial rivers. 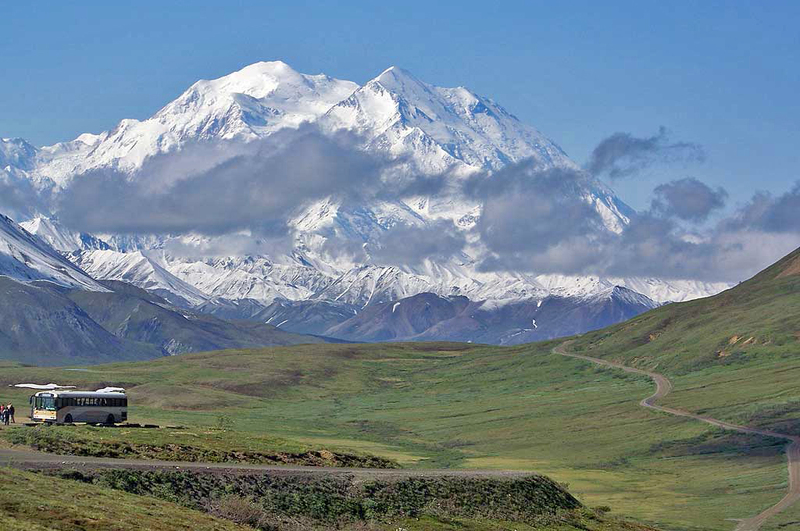 If the skies are clear you’ll see some amazing glimpses of Denali. Without clear weather, I don’t think the train trip from Anchorage to Denali would add significantly to the experience, even with their glass domed cars. We stopped a couple of days on our drive to Denali Village at the Mt McKinley Princess Wilderness Lodge, which we loved. 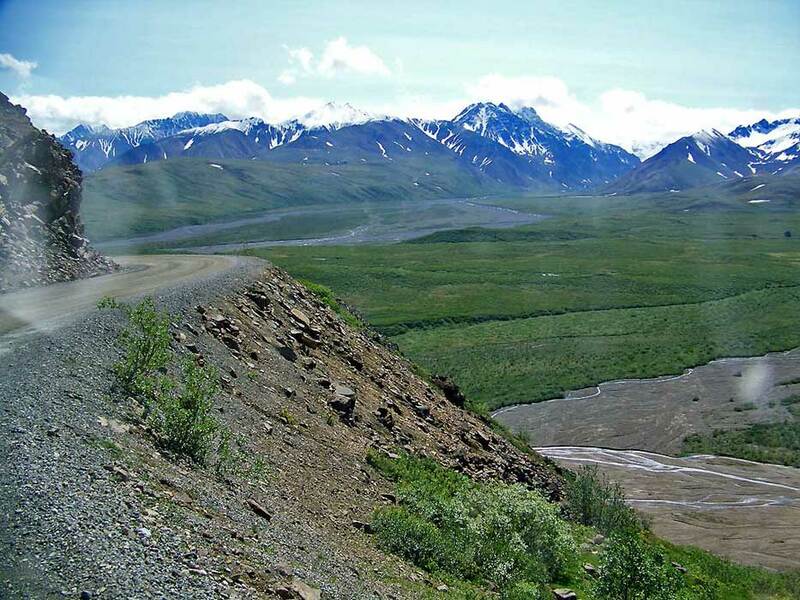 Cars are only allowed on the first 18 miles of Denali National Park. So, we made the mentally exhausting commitment to take an 8 hour park park narrated bus tour to Eileson at mile 66 of the park. Tours can be purchased directly from the Park Service in advance. We were up early for a 7 am departure. Surprisingly the sun was out on this day with bright blue skies. The sun was shining for the first time in weeks. 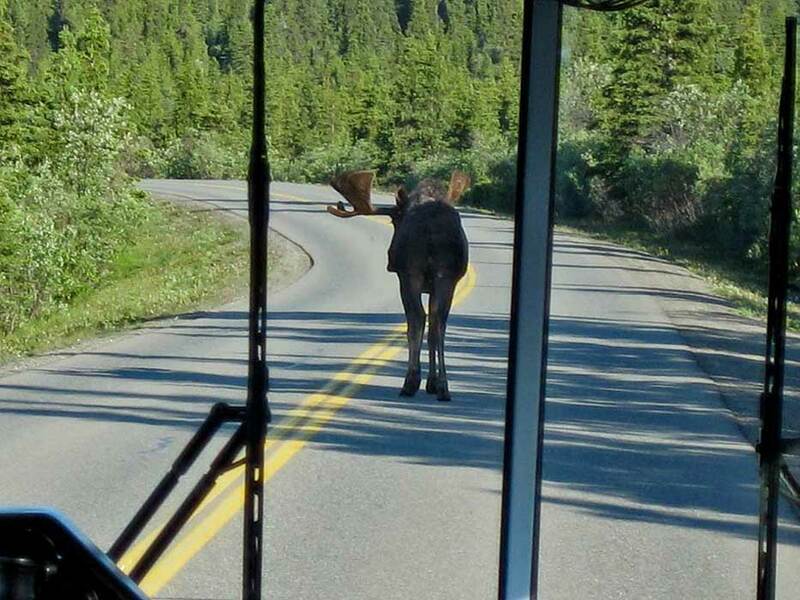 Before the Denali Day Tour bus reached mile 18, we already had seen a moose blocking the road, a grizzly bear crossing the road while a bicycler waited for it and a spectacular view of Denali. 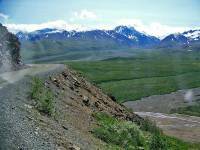 Two large glacial river basins with braided streams threading their way through the gravel. A young grizzly bear stood upright and chased the fox, while the bus passengers screamed. The guide who warned us beforehand about the importance of being quiet and respectful, was not impressed with his panicked passengers. 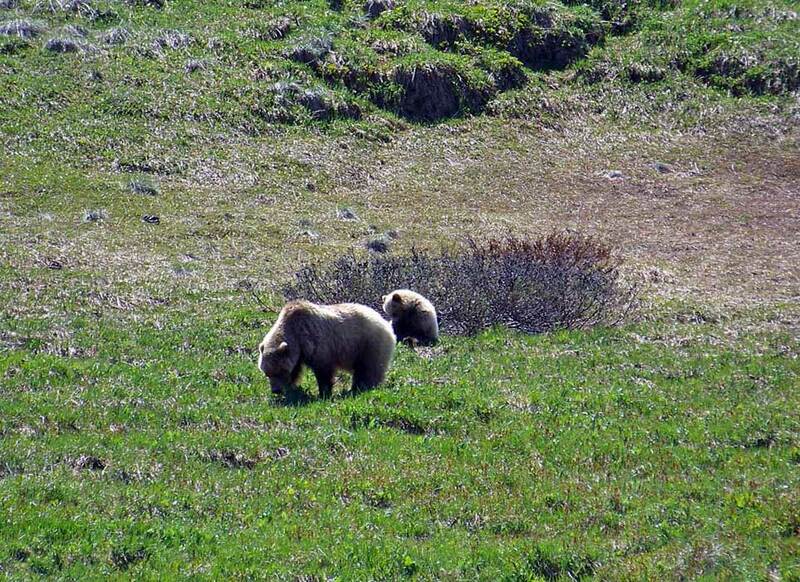 Then the fox returned and backed the grizzly down. 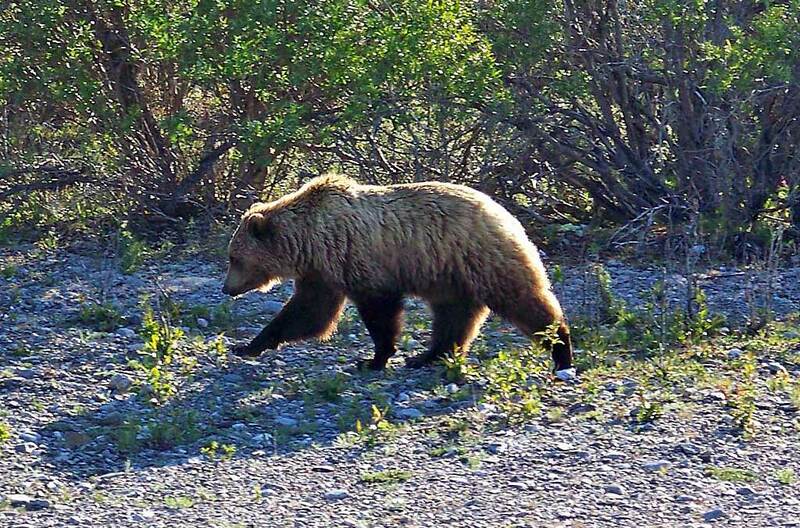 Finally the grizzly laid down and gave up the chase. A grizzly sow and two yearling cubs feeding lazily on the tundra. 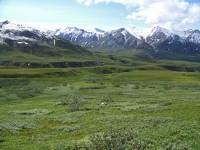 Several caribou herds in the distance and groups of Dahl sheep way up on the hillsides. A spectacular cliff edge that the bus climbs and then squeezes past other buses with inches to spare. 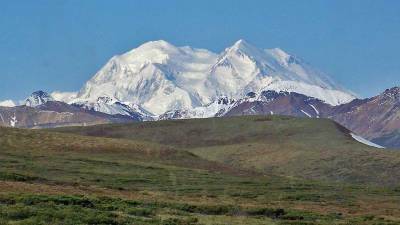 The most spectacular view of Denali as you approach Eielson. Clouds were just beginning to obscure the mountain at 11am. Only 30% of those who take the tour actually get to see more than the base of the mountain, so we felt extremely privileged. Lunch at Eielson in the cool breezes of the ice fields below Denali. There were 240 climbers on the mountain that day.